Brought To you by Norm’s Farms. Contributing Sponsors: The Station and Southern Rail, 2nd Wind, Tyler’s Tap Room, and Steel String Brewery. This year we will have 5 stages, almost 40 bands and lots of cool local vendors! And its FREE! Help us share this event with your friends and family. Our mission is to help promote local businesses, increase food security, create community resilience and to raise sustainability awareness. Come learn who these businesses are. Vote with your wallet by supporting small local business. 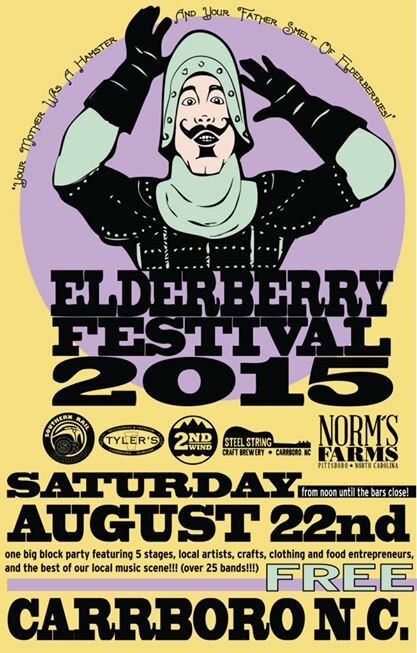 This year’s Elderberry Festival showcases the best in local Musicians. Vendors include local Craft Breweries and Wineries, local Food Producers and local Artisans. Come on out and meet some of the people that make Carrboro what it is! Join us for elderberry cocktails and participating sponsors. Raise a glass and toast to Carrboro! Any more room for another band? We just so happen to have that date open Thanks so much for the consideration and just let me know. Hey Andrea! We are hoping that another stage opens…trying to charm our neighbors. we will keep you in mind if one does. HOWEVER, we would love for you to come out to meet other musicians and network. This is an artist community building event…! Oh how we would love to be there! However, we just secured a gig for the evening. Maybe next year? Would love to see you guys and participate, be it performing or as an active supporter. Peace, and best of luck with the festival! Hey I dont know if you guys noticed but the Indy has you on their schedule for Friday 22nd not Sat.